Diving with the fun-loving students of SEASFiRE! 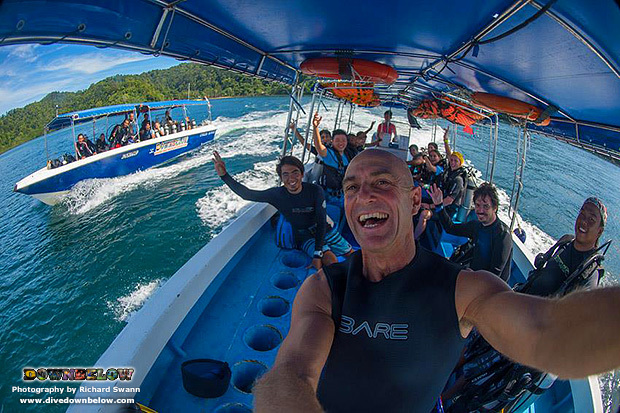 Home/Advanced Open Water Course, Borneo Adventure, Courses, Dive Kota Kinabalu, Groups & Schools, Mont Kiara International School, News, Open Water Course, Rescue Divers, SEASFiRE org./Diving with the fun-loving students of SEASFiRE! It’s been non-stop fun at our premier PADI 5 Star IDC Dive Centre on Gaya Island, as a group of fun-loving students of the SEASFiRE organization from Mont Kiara International School Kuala Lumpur visit for a scuba diving adventure! This is their second year in a row, and many participants from the previous year returned with new members joining, to learn about the marine environment, its conservation and further their PADI dive education with our team of dedicated PADI Instructors! There are a variety of recreational dive courses being conducted by several of our Instructors, who are also of varied PADI professional levels. The list of courses being taught is the Open Water, Advanced Open Water, Digital Underwater Photography Specialty, Peak Performance Buoyancy Specialty and PADI Rescue Diver. There wasn’t a dull moment as our Downbelow team educated our friends of the SEASFiRE team to explore the beautiful coral reefs of Sabah, Borneo! Get in touch with our Head Office to arrange a visit for your own group of adventurers’! We offer years’ of experience in adventure training and team building activities to tailor a suitable program for any size group! By Joanne Swann|2014-10-28T17:30:34+08:00October 30th, 2014|Advanced Open Water Course, Borneo Adventure, Courses, Dive Kota Kinabalu, Groups & Schools, Mont Kiara International School, News, Open Water Course, Rescue Divers, SEASFiRE org.|Comments Off on Diving with the fun-loving students of SEASFiRE!